This is a recipe from Pioneer Woman’s cookbook. I really like these pancakes, but my daughter isn’t a fan of them. They’re lighter than traditional pancakes and take no time at all to make! Preheat a skillet or griddle over medium low heat. In a medium bowl, combine the sour cream, flour, sugar, baking soda and salt. Stir together very gently, stopping short of the mixture being completely combined. Whisk the eggs in a separate bowl. Add the vanilla and stir to combine. Pour the egg mixture into the sour cream/flour mixture. Stir together gently until combined. Melt about a tablespoon of butter in the skillet. Pour the batter into the skillet 1/4 cup at a time. 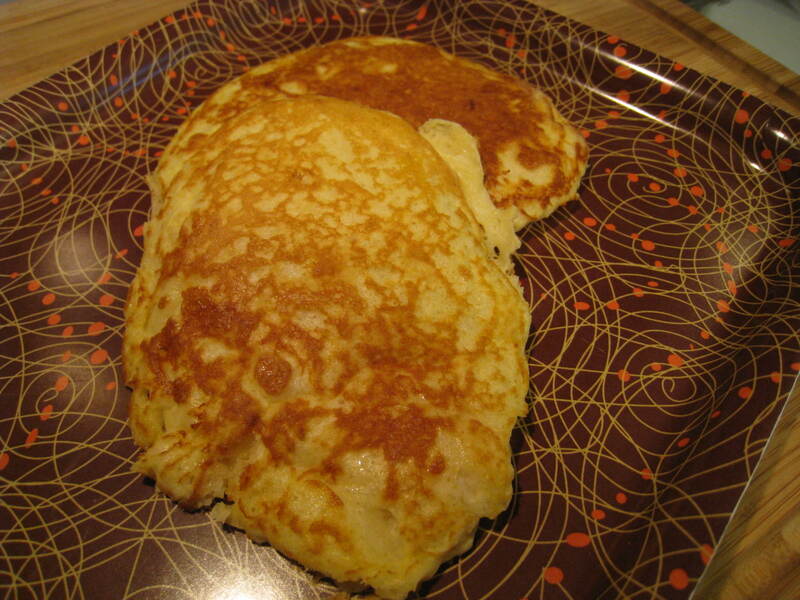 Cook for 1 to 1.5 minutes, then flip the pancakes over. Cook for another 45 seconds, remove and place on a plate. Continue until batter is used. Top with butter and maple syrup. YUM!